Does this plugin have the ability to have multiple ticket types with different prices? For example: Members pay $20 & Non-members pay $30. Thanks! I've looked and can't find an answer - but I am super stressed right now and further searching is not worth the nervous breakdown . . . so thanks for answering what might be a simple question that is probably staring me in the face. You can absolutely create variable pricing for seats in an event. 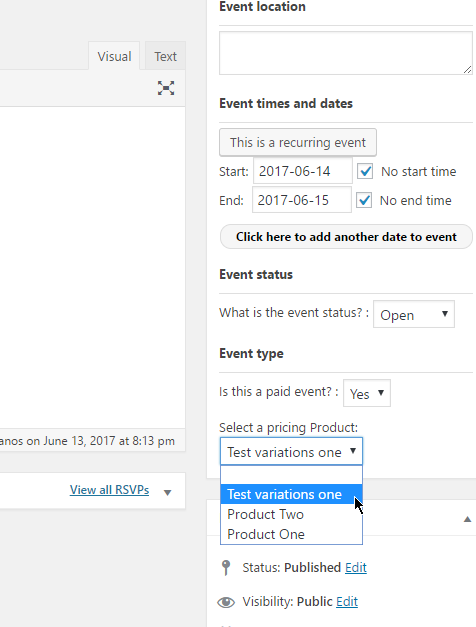 First of all, you need to activate MarketPress and enable the MarketPress addon from your Events+ settings. Secondly, create a MarketPress product with variations. Then navigate to your Event edit screen, set it as paid and select the product with the variations from the pricing. Please refer to this screenshot. Thanks Nahid! Where is the screenshot? Hi! Ok, I am still having issues with this. I'm going to try to get someone on chat. I can't get it to get it to have multiple prices.